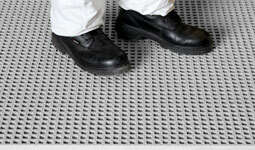 Open mesh GRP Grating is a versatile, reliable, high quality flooring and a credible alternative to steel mesh grating. With proven reliability in high traffic areas giving excellent slip resistance it works equally well in all sorts of aggressive and corrosive environments and at extremes of temperature. Easy to install due to its lightweight construction, once in place, can simply be left and forgotten with no ongoing maintenance needed. 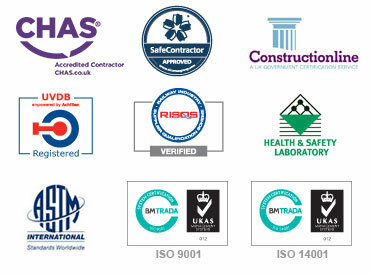 A cost effective solution to improving safety. 25mm and 38mm thickness. 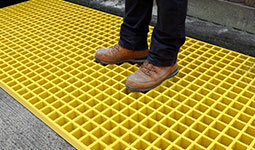 For platforms, walkways, flooring, access ramps and covers. Various sizes, 3 colours. 50mm thickness. 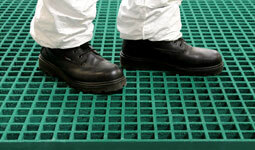 For platforms, walkways, flooring, access ramps and covers. Various sizes, 3 colours. With a smaller 12mm x 12mm mesh that prevents objects as small as 13mm falling through. The surface also offers a smoother movement for wheeled trolleys, prams, wheelchairs etc. 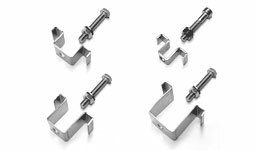 For Grating Installation, M Clips locate GRP Grating on a support structure and prevent it from turning in all 4 directions. 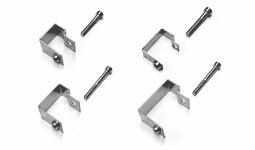 For Grating Installation for fastening and joining panels, C Clips connect two adjacent GRP Grating bars. 25mm and 38mm thick. 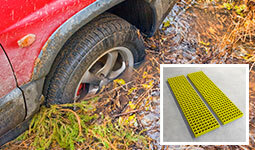 Enables vehicle recovery from sand or slippery mud on packed surfaces. No problems recovering sand ladders filled with sand or mud, just wash off later, the GRP mesh construction is easy to clean. Also great for snow and ice conditions. 50mm thick. 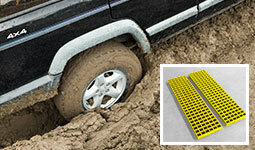 Enables vehicle recovery from sand or slippery mud on packed surfaces. No problems recovering sand ladders filled with sand or mud, just wash off later, the GRP mesh construction is easy to clean. Also great for snow and ice conditions.